It’s Sunday October 4th and there is only one thing you can do on a Sunday. BAKE ALL DAY! So if you’re from Canada, Thanksgiving is just around the corner, okay it’s next week. So, I decided that I wanted to bake some cookies to prepare myself for the weekend and make sure that they’re not too time consuming. 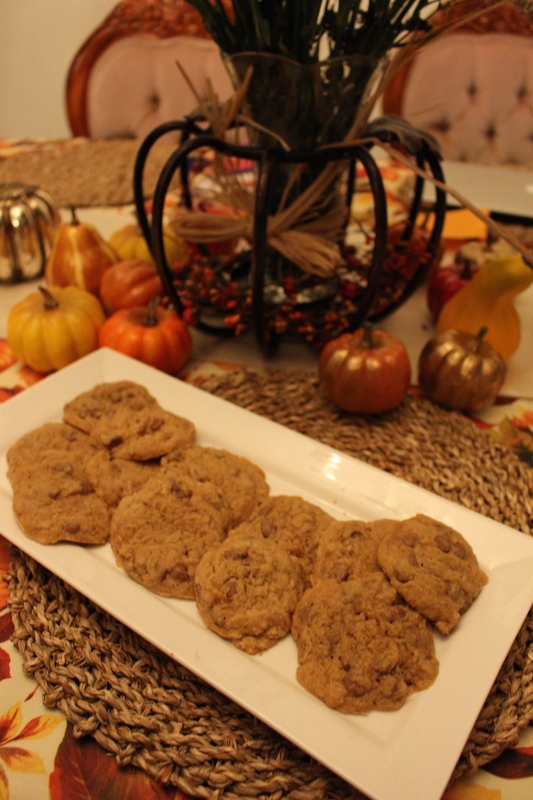 I decided to share with you two different recipes, one is store bought (YES STORE BOUGHT!!) 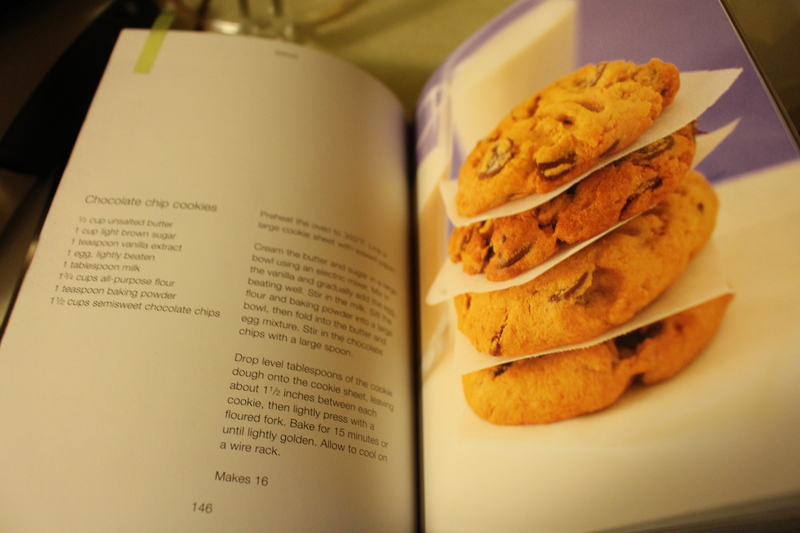 and the other one is a simple chocolate chip cookie recipe from scratch. Let’s be honest, as much as we want to gather ingredients or go shopping for ingredients, and then go all Martha Stewart and bake for hours, sometimes it’ s unrealistic. So store bought is not cheating or bad in any way. It’s actually quite convenient and awesome when you can make it your own with different twists. 1 egg, 1/2 stick of softened, unsalted butter and two tablespoons of water. time saviour and well, they actually taste quite good. So if you have no time during the holidays, I’d suggest these. They’re perfect for Autumn with a nice cup of tea or coffee while reading a good book. I love EVERYTHING about Autumn. Of course, you can make them a lot more prettier than I did. I just recently bought a cookie scooper and I’m still trying to get the hang of making them all the same size. If you liked this recipe or try a different variation of it let me know!! that my mom bought me a few years ago because I REALLY like to bake. I’m trying to be all healthy but it doesn’t mean you should deprive yourself of these delicious treats once in awhile plus you can always make them a bit more healthier. Cream the butter and sugar in a large bowl using a mixer. Mix in the vanilla and gradually add the egg, beating well. Stir in the milk, Sift the flour and baking powder into a large bowl and then fold into wet mixture and then with a large spoon mix in the chocolate chips. To bake, drop level tablespoons of the dough, leaving about 1 1/2 inches between each cookie, lightly press them with a floured fork. *since I’m lactose intolerant, I decided to use rice milk for my cookies but they still turned out absolutely delicious. There are tons of other easy, not-so time consuming baking recipes out there but since it’s pumpkin spice everything season, I opted for this store bought version and the classic-usually-everyone-loves-it chocolate chip cookies. The best part of the classic chocolate chip recipe is that you can add different types of chocolate or other ingredients to them because it’s so simple and easy. They also make perfect gifts if you put them in a cute box and take them to any dinner parties that you may have coming up. Also, I wanted to mention that my photos are a work in progress. Our family got one of those fancy cameras and I’m still learning how to use it, find the right lighting and learning to stage properly, I hope to get better at it. So I do apologize that my pictures don’t do the cookies any justice. I hope you enjoy baking these recipe or if you have any you’d like to share, just let me know in the comments below. The other plus side of having baked goods in your house is the smell. Gosh, my house smells like autumn. It’s so comforting. Christmas is just around the corner and I’ve been so busy prepping. It is my first time (along with my sister) cooking Christmas dinner. If you know me, I enjoy cooking. I love spending time in the kitchen whether its baking cakes or cookies or making different dinners from vegan, vegetarian and now meats again (Since I am no longer a vegetarian, well I only eat white meat. I still don’t like red meat). Anyway back to my point, It’s really exciting that our mom has let us take control of the cooking this year. We wanted her to take a break since she’s always doing the work. Since I am Hispanic, there always has to be lots of food and treats around the house. So we have had our traditional tamales and sweet breads. But since I am also Canadian-born, I like to embrace both by cooking and baking a variety of different things. It’s been an interesting Christmas holiday. Ever since school ended for the semester, I’ve baked like crazy. Minced meat tarts, short bread cookies, sugar cookies, pound cake and so much more (my Instagram is filled with it all). Our Christmas dinner is what I’m anticipating, so here are some of the things I did that have helped me and will hopefully make our dinner a success. 1. A week before Christmas dinner have a plan– My sister and I spent a whole day figuring out what we wanted to serve and after 3 episodes of Jamie Oliver’s Christmas special on T.V, we established the basics. So we made a list of everything we needed. 2. 3-4 days–we got our veg! We went through our list and started buying the things that we planned to cook. Not everything was bought because we wanted herbs to be fresher for the day of. A lot of shopping occurred from household decor to dinner tools. We also double checked our list to ensure we had everything. 3. 1-2 days before. We completed our shopping (although we did forget an aluminum foil pan…oops! ), we started peeling potatoes and leaving them in water in the fridge. We have chopped up all the veggies that are going in with the turkey. 4. Night before: All other veggies are chopped up and in the fridge, the turkey is clean and prepped to roast. All plates and bowls are nicely stacked and washed for the food (Thanks to Rachael Ray for the tips!). All other ingredients are on the counter and we have our list ready to get checked off. Now lets hope for the best! Our recipes are pinned to the fridge, our hearts are hopeful, the alarms are set and even the cutlery has been prepared! 5. Everyone has duties for tomorrow (We have Christmas Eve dinner rather than Christmas day dinner…then we stay up and dance all night long and open our presents REALLY early). We make sure the house is clean and prepared for our lovely, delicious dinner! I hope my little set up of how we prepared for our first Christmas dinner helps anyone who is hosting for the first time. My best advice is definitely looking at websites with recipes and advice for the holidays. It’s the one thing that I did and I feel really excited. Maybe, I’ll end up writing about how it all goes down or not. I hope you all enjoy your holidays! !